I was accepted to create an artwork as part of the arts trail for Splore 2018 at Tapapakanga Regional park. My concept for Splore was to create a fabric installation that people were able to walk through and experience or alternatively take shade under. My installation consisted of 4 large lycra panels of varying sizes (6m, 4.5m, 4m and 3m). The theme for Splore 2018 was Mystic Ritual. I incorporated my mark marking and calligraphy to create a mystical story on the fabric panels. It will embodied messages, some legible, others quite abstract. 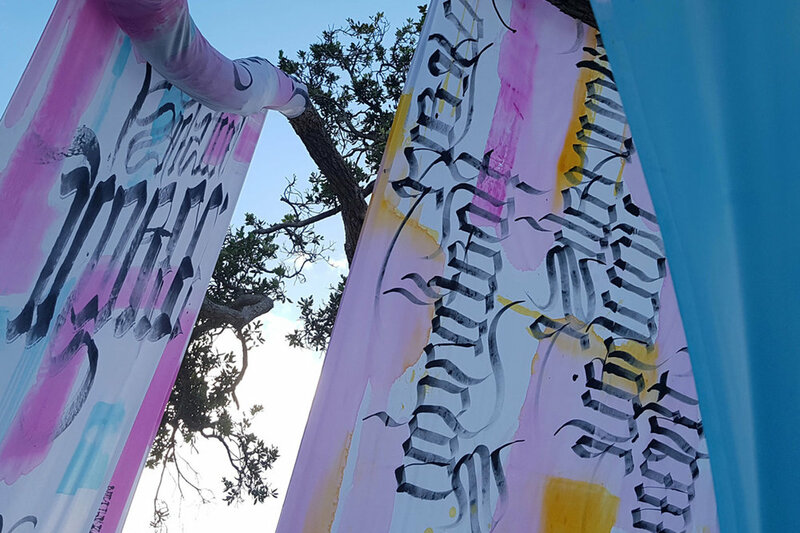 The tree by mainstage became the structure for my panels, each pulled out and pinned to the ground so the artwork could be experienced from all different angles. This was the first time I had attempted an outdoor installation, it brought up a number of challenges but in the end was really successful and I loved seeing people interact with the artwork.